Guests can sometimes be stuck to their chairs all night and not socialize. To keep your guests from suffering for “Tree Stump Syndrome” I crafted some activities to get people talking, laughing, and, most importantly, learning more about the guest of honor. I needed something to match my ‘Last Class’ theme that would get the guests to interact with one another doing something benign and silly. These little activities usually help people loosen up and helps make the party more memorable. I decided to create a song as a tribute to the guest of honor. The springboard for the idea came from a message board site. I liked the Yankee Doodle themed song since could download it from you tube without words to have the guests sing to at the party. 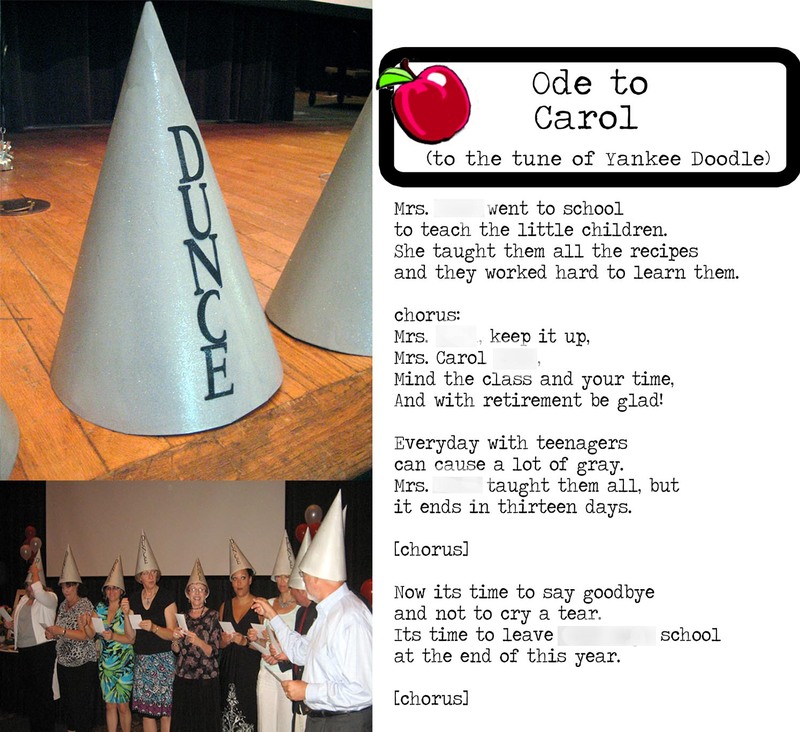 To keep with my theme, I decided that I would make Dunce caps and those with the caps would automatically be chosen to sing the song at some point during the party. At first, the Dunce caps were around and people merely thought they were just decorations for the party. However, the guest of honor began to choose people as she met and chatted with them. She picked people like her old boss, some old friends, etc. As soon as they received the hat, I discretely went to them and handed the song so they could read it over. The guest of honor only knew she had to hand them out, but did not know why. Then before the speeches, we asked all those ‘Dunces’ to come up to the front to receive their ‘punishment.’ Since I had about 10, people who were shy could still get up there without feeling bashful. I was surprised at the amount of people who got out cameras to get everyone singing! Everyone got a kick out of the whole production! I bought gray poster board and referenced First Palette for a little help on making a conical hat. I measured my head with the string and then halved it. I then attached the string to a pencil, held the sting at the center of my circle, and traced my semi-circle. I cut out the shape carefully. Then I secured the hat with a staple at the bottom and then fixed the rest of the seam with dabs of hot glue. To make it more festive, I bout some spray glitter and glittered those bad boys up! I also used my Cricut to cut out the letters “Dunce.” I glued those on prior to the glitterization. Another idea was to help the guests be better informed about the retiree. To do that we had a memorabilia table with old pictures, old year books, awards, etc. spread along the table along with mementos and decorations. In addition, we had a sideshow running that had fun facts about when she started teaching compared to now (e.g., the average teacher salary from the 60’s to average teacher’s salary now). Hopefully all the guests were paying attention because we had a POP QUIZ right after the speeches were done! I printed these out on my card stock I used for all the rest of my projects. 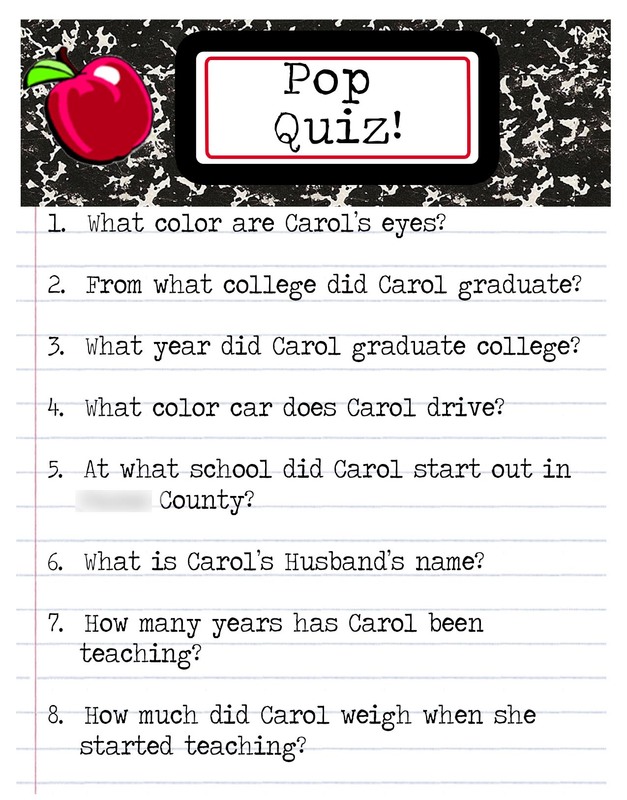 I chose questions that were tailored to those who attended (like the neighbors invited would get the car color correct, while work people would know about how many years she taught). The questions were meant to entertain and to get people laughing and, at the same time, learning a little more about the retiree. We also had some tie breakers in case we needed them. We gave the top two guests gifts for getting the most questions correct.